I get asked this question quite a bit and I see it asked on screenwriting forums often. The short answer is this: In my experience if you don’t know how to get an agent you probably aren’t ready for one. Getting an agent isn’t the be-all-end-all in screenwriting. I’ve optioned dozens of scripts and sold a few and I’ve done so without the benefit of an agent on every single sale and option I’ve ever made. I have had a few agents over the years but they did a lot less for me than I was doing for myself so we usually parted company after a few months. The idea that all you need to do is get your script to a good agent and he’ll turn all your screenwriting dreams into a reality is a myth. A lot of writers (and actors too) think that if they have an agent all they’re going to need to do is write and that their agent will find them writing gigs and sell their scripts. While this may be true if you make it to the very top of the screenwriting eco-system, it’s not true if you’re just starting out or even if you’ve sold a few scripts. Besides, it’s a horrible way to live your life even if it were true. Do you really want to be 100% dependent on someone else for the future of your career? I know I don’t. I know a fairly well established television writer who got an agent early in her career and never had to spend any of her time selling her scripts. She wrote a great spec television script, got it to the right agent, and was hired to write for a major television show. Now 10 years later her career is slowing down and she has absolutely no idea how to sell a script. All she can do is write spec scripts and send them to her agent and then wait for her agent to call her. Her agent is calling less and less. This example is close to best case scenario, too. The reality is that most agents who are powerful enough to get your material produced don’t have time to look at material from new writers, and if they do it’s only because someone they knew well has recommended it to them. If you follow the steps I’m about to outline below about how to get an agent, what will most likely happen, if your writing sample is very strong, is that the only agents who will be willing to sign you as a client will have as little chance (or even less chance) of selling your script as you do yourself. They’ll either be young agents new to the industry or an established talent agent that runs a ‘literary’ branch on the side. Keep in mind signing with either of these types of agents is not without value. But if you do sign with them don’t make the mistake of thinking you’re on easy street and don’t have to keep pushing your scripts yourself. Having any sort of an agent, even one with no real credits or clout in the industry does give you some additional credentials. Most “screenwriters” don’t even have a bad agent so you’ll look more professional than many people when you make submissions by mentioning this in your query letter. For instance, many production companies will not accept submissions from writers directly, so you can have your agent submit it for you or simply submit it on behalf of your agent. But in either case it’s you out beating the bush for sales. One last point I’d like to make about trying to find an agent. Try and put yourself in the position of that “good” agent who has lots of contacts and can get a script made or get a writer hired onto a television show. How would you try and find up-and-coming talent if you were that agent? Reading blind submissions is just too time consuming and costly. The chance of finding one great script in a pile of thousands doesn’t justify the rewards. Their time is too precious. However, if an up-and-coming actor tells the “good” agent about a recent short film he did that won a writing award at a film festival and that actor gives a copy of the short film to the agent along with that writer’s newest feature film script, the agent will probably consider the submission. The “good” agent will probably look at the short film and if he likes it he might take a look at the feature script. This is how connections are made. This is how you get a good agent. You build your writing resume one project at a time and eventually things will start to open up for you. With that said, there are a few ways that you can try and get an agent. Just to reiterate, even if you get an agent it doesn’t mean you will be able to sit back and just write. You’re still going to have to spend a lot of your time trying to get your stuff produced because most likely your agent won’t. Keep in mind too, I highly encourage you to do exactly what I’m going to spell out below even though I doubt it will result in you getting a “good” agent. Any agent is better than no agent (usually) and it’s just one more angle that you should be pursing to get your scripts made. Who knows, they might just sell one of your scripts for you and at the very least they might give your own submissions a little more juice. As a rule all the agents on this list are reputable. They must agree to adhere to the WGA rules to be a signatory agency. Most of the agencies you’ve heard of (CAA, William Morris, etc.) simply won’t accept unsolicited submissions and will probably send your query letter back un-read. Don’t worry too much about this. Just send your query letter to every single agency on the list and see if anything sticks. It probably won’t but you never know. Or you can buy it from Amazon by clicking here. Make sure you get the “Representation” edition. The HCD is a great resource because it lists managers as well as agents and you might have a little more luck finding a manager. The exact difference between an agent and a manager will be covered in a future post, but suffice it to say that an agent is more geared towards selling your script and getting you work as a writer while a manager is more geared towards career development and might be able to act as a script consultant and help you develop your work. This is the path I’ve chosen; I currently have a manager but not an agent. Update: IMDb Pro is now a much better resource for this sort of data collection. You can sign up for IMDBPro.com by clicking here. To see a video demonstration of me pulling out contact information for agents check out this video: How To Build A Database Of Agents To Send Your Query Letter To. To submit you’ll want to write a professional query letter. My query letter is usually around ½ to ¾ of a page long where I introduce myself and two scripts with log lines. I also include a 1 page synopsis for each script that I pitched in the query letter. NEVER send a complete script unless they’ve requested you to do so. Years ago it was considered polite to include a self-addressed stamped post card so they could easily reply to you, but I’ve found most of the time they’ll just pick up the phone or drop you an email so make sure you include a phone number and an email address in your query letter. Read my full post on how to write a professional query letter by clicking here. Be careful. There are a lot of so-called “agents” and “managers” out there who will want to charge you something to help you “develop” your screenplay. An agent or manager may be willing to take you on as a client “if” you use the script development services that they recommend. DO NOT DO THIS. Any reputable agent or manager does NOT charge you anything upfront for their services. They only get paid when you get paid. Typically agents get 10% and managers take 15% – and only when you’ve earned money as a screenwriter. If they want up-front fees for anything or try and sell you something their business is selling aspiring screenwriters services NOT selling screenplays to producers so don’t bother with them. 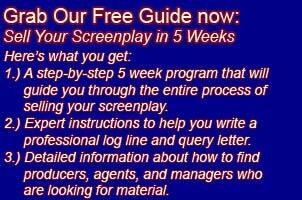 Previous post: How much should a writer get paid for their screenplay?